It is said that Cleopatra could speak seven languages and had exquisite taste. Egypt’s ancient wise monarch would certainly approve of this trip to Egypt, fit for a queen. 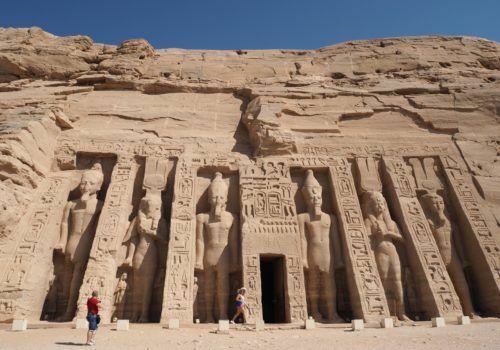 This intriguing country of gods and goddesses, pharaohs and fantasies will inspire and surprise you as it has done so to its travellers for centuries. But Egypt is so much more than mythology and magic and offers more to see and do than ruins and camel rides. This trip to Egypt brings out the rich history, culture and cuisine in addition to the things every visitor to the country must experience. At times you will feel like a pharaoh, while at other times you will see the authentic Egypt of today, and what it means to live in this fascinating country. However, your highlight will likely be our 4-night cruise aboard the Sanctuary Zein Nile Chateau, perhaps the most elegant boat on the Nile. Upon arrival in Cairo airport, where your Tour Coordinator will meet you before immigration and transfer you to your hotel. Then it’s off to the hotel for a welcome cocktail where hot and cold canapes will be served before having dinner where you’ll get to know your group. You’ll start with a tour of the Egyptian Museum where you’ll find over 7,000 years of history. It houses the largest collection of ancient Egyptian art in the world so you’ll want to ensure you see the treasures of the boy-king Tutankhamun, including his gold mask, the solid gold sarcophagus that held his mummy, and his beautiful throne. Afterwards, we’ll head to the fascinating Khan El-Khalili Bazaar which is reputed to be the largest bazaar in the Middle East. Originally founded as a watering stop for caravanserai in the 14th century, the bazaar has now grown to vast proportions. As one wanders through the labyrinth of narrow streets you will find workshops and stalls selling all manner of things from woodwork, glassware and leather goods to perfumes, fabrics and Pharaonic curiosities. After lunch Naguib Mahfouz restaurant you’ll visit the Citadel. Perched high on limestone hills above Cairo, the Citadel is a medieval fortress built by Salah El Din in 1176 to protect the city from Crusaders. The Citadel has always had a military use and was expanded over the centuries by Egypt’s rulers who often resided there. Today, the Citadel complex has mosques and museums, including the National Military Museum. We’ll also stop at the Mosque of Sultan Hassan as well as the Refaie Mosque. Today you’ll board a flight to Aswan and upon arrival visit the Philae Temple. According to the Ancient Egyptians, the goddess Isis traveled all over Egypt gathering her husband Osiris’s remains after he was cut to pieces by his evil brother. On Philae Island, where she found his heart, the Egyptians built a sacred temple to Isis, goddess of purity, sexuality, nature and protection. During the building of the High Dam, Philae Island was submerged by water, so UNESCO helped transport the temple complex to nearby Agilika Island, where you see it today. You’ll also visit the famous unfinished obelisk which was abandoned in Aswan’s Northern Quarry when a crack was found as it was being carved from the red granite. Tools left behind show how builders accomplished such great work. In the afternoon you’ll sail to Kom Ombo. In the Ptolemaic temple shared by two gods, Sobek and Horus the Elder, everything is duplicated symmetrically, with double hallways, doors and chambers. You’ll sail this morning to Selsela This is the border of the Egyptian region of Nubia, and in ancient times, Egyptians believed that the Nile originated here. Explore the largest and most preserved Pharaonic temple in Egypt – the Temple of Horus in Edfu. You’ll then enjoy afternoon tea and dinner on board. After breakfast on board you’ll visit the Esna Temple which was built during the reign of Roman Emperor Claudius. You’ll then have lunch on the boat as you sail to Luxor before visiting Luxor Temple which is dedicated to the god Amun and built by Amenhotep III in 1380 BC. This morning it’s your opportunity to visit the iconic Valley of the Kings – a vast City of the Dead where magnificent tombs were carved into the desert rocks, decorated richly, and filled with treasures for the afterlife by generations of Pharaohs. You then have the option to visit three of the following; The Valley of the Queens, Hatshepsut Temple, Valley of Workers, Tombs of the Nobles, Medinet Habu or Ramesseum Temple. In the afternoon there’s a visit to the Temple of Karnak, built over more than a thousand years by generations of Pharaohs. The great Hypostyle Hall is an incredible forest of giant pillars, covering an area larger than the whole of Notre Dame Cathedral. This morning you’ll fly to Cairo before your onward journey to Giza. You’ll start by visiting Memphis, Sakkara and the famous Cairo Market. This afternoon, and perhaps the highlight of the trip, you’ll visit the Pyramids and Sphinx. The Great Pyramids of Giza are the only present-day survivors of the Seven Wonders of the Ancient World, built about 4500 years ago as giant tombs for the mummies of the pharaohs Khufu, Khafre and Menkaure, who were a father, son and grandson. The pyramids are truly monumental in scale, with the largest, Khufu’s, made of over 2 million blocks. The pyramids were not built by slaves but by Egyptian peasants who paid their taxes to the Pharaoh through this labour and were fed, clothed and housed by him. We’ll also visit the famous Sphinx.